EnviroLogic Resources is now offering sampling packages for this spring's water quality monitoring event. 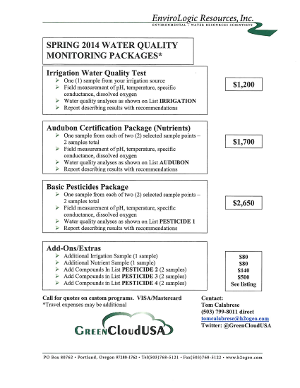 Click the image on the right to download our listing of Spring 2017 Water Quality Monitoring Packages. As always, we can customize any program to meet you or your clients' specific needs. Contact us now to schedule your sampling event.